Vancouver – Is there a better place in the world to develop, test, and launch an umbrella sharing service? 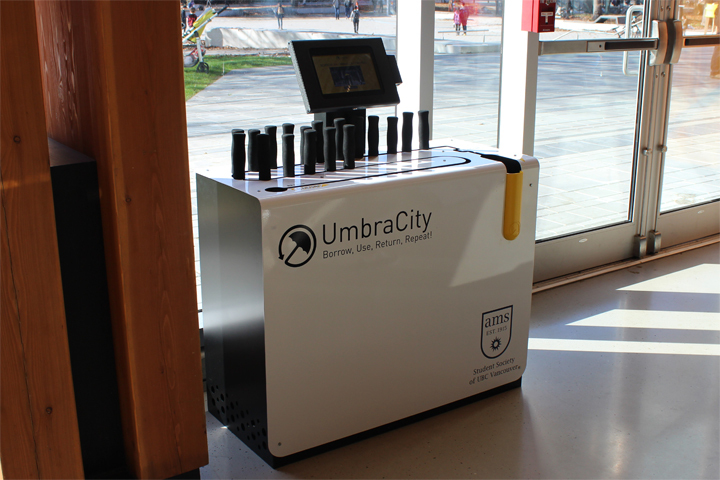 The UmbraCity umbrella sharing system allows users to borrow an umbrella for free providing it is returned to any UmbraCity kiosk within 48 hours. Tangram Design worked with UmbraCity to commercialize their initial prototype and to develop a kiosk that was memorable, durable, and cost effective to manufacture in small batches. The kiosk features a sheet metal enclosure design that is easy to spot on campus and offers opportunities for advertising to help subsidize the service. Users register with the service once and then can quickly grab an umbrella anytime they need it. The first kiosks produced have been installed on campus at the University of British Columbia as part of a pilot project to test and optimize the system. Watch out for more kiosks coming to a rainy destinations around the world soon!